March 28, 29, 30 at 7:30; March 31 at 2:00. 2018 Fall Play - Places Everyone! San Rafael High School students will be creating magic under the sea with Disney's The Little Mermaid March 22 -25 in the Hayes Theater on the San Rafael High School campus. Shows are at 7:30 on Thursday, Friday and Saturday; 2:00 on Sunday. Tickets are $10 for students and senior citizens; $15 for adults. A super fun show for all ages! 2017 Fall Play - Is He Dead? Is He Dead? A New farce by MARK TWAIN, adapted by David Ives. The story is of Millet, a brilliant but impoverished painter; no one will pay good money for his paintings while he’s still alive. When his friends persuade him that the secret to success lies in convincing the world he’s dead, Millet hatches a scheme which could make him rich, famous, and able to marry the girl of his dreams—if only he didn’t have to be a corpse to do it! The Tony Award winning, GUYS and DOLLS. "SIT DOWN, YOU'RE ROCKIN' THE BOAT!" (lyric from GUYS and DOLLS) -- Crap shooting gamblers, Hot Box dancers, New York scam artists and reformers fill the stage. SHE KILLS MONSTERS - a lively action-packed anti-bullying play which travels back and forth from reality to fantasy as a sister discovers her deceased sibling through acting out her Dungeons and Dragons module. Our twenty cast members are having a lot of fun discovering the fantasy and real-life monsters and learning how to fight them. True love, sword fights, tales of life in the swamp, and unexpected twists turn this production based on the story of the Princess and the Pea into a lively musical comedy for all ages. 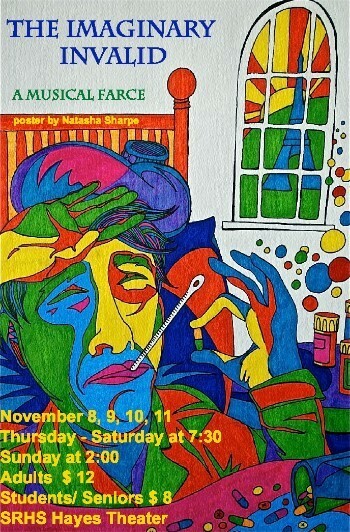 “Truth and Consequences” is a combination of two short plays being presented by San Rafael High School on November 12, 13, and 14 at 7:30 and November 15th at 2:00. The first play is based on the infamous short story by Shirley Jackson, “The Lottery,” that caused a sensation when it was published in 1948 and shows the consequences of unquestioned tradition. The second is “Twelve Angry Jurors” by Reginald Rose and is a powerful study of a jury deliberating a death penalty case. Although the original play (a live television special then called “Twelve Angry Men”) was first produced in 1954, it is still relevant today because the subject is racial prejudice and the jury system. Supreme Court Justice Sonia Sotomayor has said that seeing Twelve Angry Men while she was in college influenced her decision to pursue a career in law. She was particularly inspired by immigrant Juror 11’s monologue on his reverence for the American justice system. Join us and our SRHS cast of 45 for this rollicking musical about parents and teens in the good old 1950s when wearing poodle skirts and pony tails were the fad and communication was by phones that had to be dialed since cell phones and computers hadn't been invented. Teen idol Conrad Birdie (Elvis) has been drafted into the army; thousands of teens protest, but one lucky girl gets to kiss him goodbye on national television on the Ed Sullivan Show! Filled with fun and interesting characters, physical comedy, dancing and song, Bye Bye Birdie has something for everyone. This streamlined musical version of Shakespeare's popular comedy features 33 cast members, 1960's style costumes, and hits from the sixties, like "Wooly Bully." Especially adapted for San Rafael High, this now-original work takes place in a magical forest populated by mischievous fairies who are always ready for a song or dance. Two Athenian couples find themselves falling out of love with the right people and in love with the wrong people courtesy of a love potion; even the fairy queen falls victim to the love potion and finds herself head over heels for a very unusual being. Meanwhile, six would-be actors meet in the forest to rehearse a play to present on the Duke's wedding day. They are hoping for high drama; they get hijinks. Don't miss it! Crazy for You is a riotous, rambunctious, rip-snorting musical in which and romance and Gershwin tunes abound. The rich son of a banking family, Bobby Child, played by Miles Allen, longs for a career on the stage (much to the chagrin of his mother). Fortunately, he’s sent to Deadrock, Nevada to foreclose on an unfortunate theater. There he falls in love with Polly, the only woman in town, played by Gianna Ciaccio; Polly is already hopping mad at whoever is coming to close down the theater. Time for Bobby to put on a show to save the theater and win the girl of his dreams! Not so fast! First there are impersonations, mistaken identities, unrequited love, and lots of singing and dancing. Join seniors Chris Domer, Jeremie Massaloux, Bella Breen and 17 other cast members for a fun-filled theatrical experience. SRHS drama presents the Oregon Shakespeare Festival's 2011's runaway hit, The Imaginary Invalid, a sparkling musical adaptation of Moliere's comedy classic. This contemporary version sets the play in Argan's kicky 1960s Paris townhouse, where love and joy overcome fear and sickness. Featuring hilarious characters, original songs, and non-stop physical comedy, The Imaginary Invalid is a buoyant treat for all. 2012 Spring Musical - Some Like It Hot!